It’s the start of the week and my mission is to cut three transect lines off grid by Wednesday in N5. Moses (Lemi) and Moses (number two) turned up with their Pangas (machetes) sharpened, bright and early and eager to start. 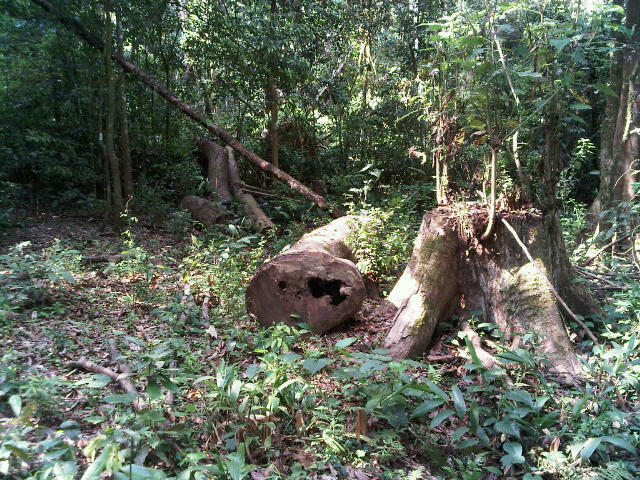 Historically, N5 is a highly logged compartment and conservationists at the Budongo Field Station believe most of the Cordia in this area was pilfered a long time ago, but we are still uncovering pit-sawing sites. I’m hoping I’ll still see the remnants of stumps which will confirm this belief, otherwise who’s to say that Cordia ever existed here? Something I will obviously have to ask the officials at the National Forestry Authority when I interview them. The structure of the forest in N5 is completely different to W21. It’s very fragmented and blindingly obvious to even a novice like me. There are so few large trees I can see clearly for about 30 – 40 metres either side of my makeshift line without any difficulty. There are shrubs growing but nothing above chest height. What is flourishing here though are caterpillars. There are hundreds of the little blighters. I’ve never seen ones like these. They’re tiny and black with small red markings towards the end of their bodies. They’re about half the length of my little finger and about 1mm thick. These caterpillars spin webs like spiders and hang suspended in their fragile silk homes. The cobwebs carefully bind the leaves of shrubs together. They seem to be motionless until you brush past. Then, once disturbed they abseil down from their webs like silent Ninjas; drop onto you and proceed to concertina their bodies back and forth as they explore their new environment. Their silk webs are sticky too. I spent most of the day clawing at my face trying to find the invisible threads tickling me, to no avail. As we slashed our way through N5, with caterpillars in tow, we followed a flat path that began to gradually incline, there was steep drop as a valley appeared below us. I’m not particularly graceful at the best of times in the forest so Lord knows what the boys thought of my trekking sideways down a steep hill. Underfoot, just to make matters more complicated was debris consisting of slippery branches and leaves. 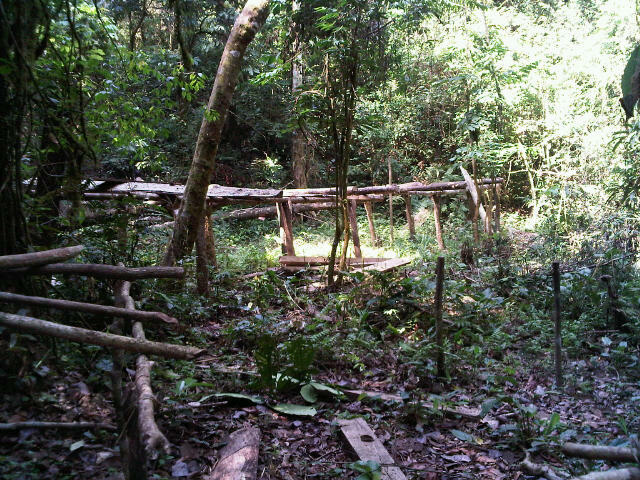 My feet also crashed through a few decayed logs which I had to stand on. It’s hit and miss how long a log has been there and whether it will support your weight, I learnt the hard way, sneezing hard many times from a cloud of rotten bark that shot up my nostrils. At the bottom of the valley we began to climb up again until the ground levelled off, here the terrain changed once more. Again there were few mature adult trees but this time the shrubs had overgrown and created a corridor of dense thorny thicket. We had to duck and creep our way through a few of those as we were prodded and poked by stray branches. As we were nearing the end of the kilometre my worst nightmare appeared before me, a carpet of Red Safari Ants (RSA). I had been warned by Prof Reynolds that when they are marching in a line, they’re easy to spot, but when they haphazardly cover the forest floor, that’s when it’s time to bolt – Usain style. “Ants! !” Moses (Lemi) shouted back at me, as he started to jog ahead. My boot had just touched the moving floor and on hearing the warning I sprinted over them on tip toes, hurdled a large log and continued to run like my life depended on it until I passed Moses. When I finally stopped, I bent over, hands on hips, trying to catch my breath. Unbeknown to me, somehow, one of the Bastards managed to cling on. He quietly proceeded to crawl up my leg. The problem with these ants is they don’t bite immediately. Five minutes later when I thought I’d escaped any potential discomfort, I felt a sharp needle-like pain in my calf. “You have something in your trousers?” Moses asked concerned. “Dunno,” I said slowing down. “I hope not, but it might be an ant.” I said rather upset. As I stood still I carefully made a fist around a part of my gaiter and some of my trouser leg where I’d felt a sting. Then I carefully turned the material inside out. Sure enough there was one enormous RSA. The largest one I’ve seen yet (no exaggeration). “Moses help!” I squealed pathetically. “There’s an ant.” I tried to flick it out but it was moving too quickly and I was panicking. Moses grabbed the body and carefully plucked it out from my gaiter. He turned it upside down to show me the size of its pincers. It struggled angrily, flailing its legs around in a frenzy. And in one clean move he cut it in half with his Panga. I have to say I felt very little remorse for it and continued to scratch my leg all the way back to camp.